When you go somewhere, you have this idea that you will be open minded. Embrace the new things. Different strokes for different folks… Blah blah blah. And for the most part I would agree. In fact there’s a lot I will deal with, crowded trains where you are up on everyone, drivers who feel that it’s ok to drive down the middle of 2 lanes. But there’s 1 thing I refuse to adapt to. Yes, that’s a motorcycle taxi with the crowd waiting at the crosswalk to cross a road when the little green man turns on. Like I said “What are sidewalks for?” Apparently for driving when the roads are full. (Hint: that’s always). I refuse to accommodate them. They can go around. Since they are going 5mph, there’s a good chance falling over will hurt more than the hit I’ll take. Luckily the sidewalks are also for walking to lunch, which I get to do nearly every day with my team. I’m very thankful for this, but it is also the source of my multiple faux pas. Case 1, learning to eat. Some might call it fork and knife school. If you do, you may want to rephrase. There is a box which sits on the table in the restaurant with silverware. It comes to me, and I see forks and spoons. Since I’m not having soup, I get a fork and go to pass the box on. Kh. Padet loos at me…I look back. We stop. “Aren’t you going to get a spoon” he said. Huh? I say no and we move on. When we start eating I realize it should be called fork and spoon school. After all, one eats with a fork in the left and a spoon in the right. This happened early, and I’ve adjusted. Case 2, table manners. A little back story. Kh. Siriporn and I head out to the plant which is 1.5 hours north of Bangkok to meet and greet as we are both new. It went very well and I got to see 2 of the guys I helped train in North America, Kh. Jack and Kh. Uthai. The second day, they decided to take us out to lunch. We arrive and food is on the table. It’s soup, stir fry veggies, bowl of rice and a full fried fish, head and all. It’s family style. All take rice and all but kh. Jack start to serve themselves a little bit. I take a little of everything. Jack takes nothing and says something to the waiter to order more food. I ask, “do you not eat what’s on the table” there was a bit of a language barrier so relaying the question took a little time. The requested dish arrives, it’s a red curry something and still family style; so it’s not his plate. Lucky for me Kh. Uthai understands and thinks of his response. “It’s Thai custom, we only take a little bit at a time”. I look around at their plates full of rice and only 1 topper, then I look at mine…some of everything, nearly enough to make my meal. Lesson learned. In retrospect I realize this is not the first time I’ve done this. “Yes”, I respond as I look at a lightly faded picture containing the 3 head shots of monks. Which I know means money, so I say,” uh huh”. She nods in agreement, and I start to chuckle a little. Was she joking…or was this my third identified faux pas, I truly have no idea. So back to my original question, what are sidewalks for? I’ve determined that they are for wandering, for shopping, for snacks after lunch, a local guided tour of Thai culture, and learning and appreciating my surroundings a little more each day. 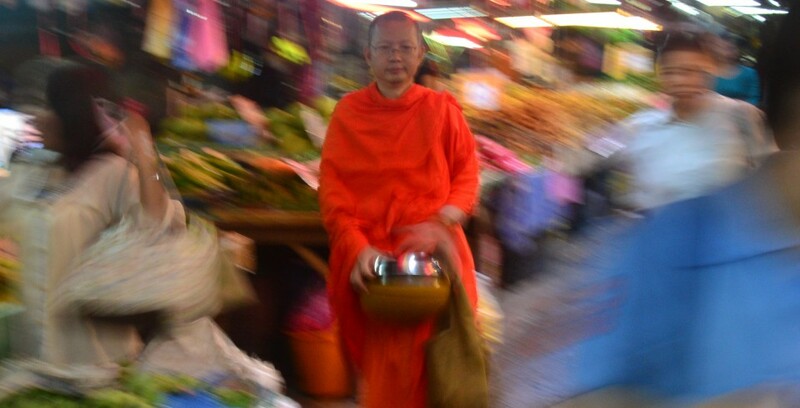 This entry was posted in Life In Bangkok and tagged Bangkok, Expat, motorcycle taxi, Thailand. Bookmark the permalink. Love hearing all your news..we Anglo-Indians in India always ate with a spoon and fork!